Matcha Milk Tea is a refreshing beverage made with matcha powder and your choice of milk and sweetener. I discovered matcha milk tea at a Taiwanese tea shop and boy I am hooked. It’s refreshing and has a slightly earthy flavor but when served iced cold with milk and sweetener, it really balances everything out. I have been experimenting with Matcha Milk Tea with different milk - dairy and non-dairy alternatives + different sweeteners so I could sip on Matcha Milk Tea as my health drink! 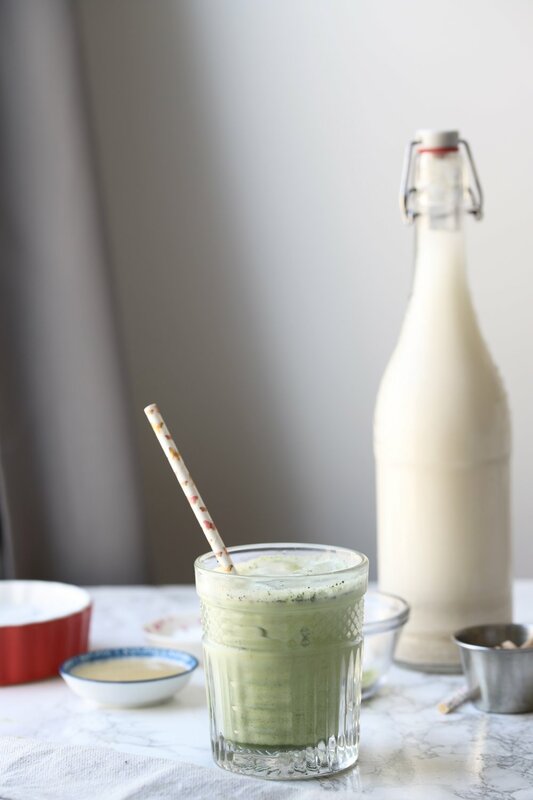 If you are into matcha, you are definitely going to love this Matcha Milk Tea…to those of you who are on the fence about matcha, make yourself a chilled glass of Matcha Milk Tea and report back to me. Matcha is very trendy these days so let’s quickly matcha and it’s types. Simply put, matcha is a powdered green tea that is specially grown and processed. The leaves are shaded from direct sunlight about twenty days before the harvest which boosts it’s chlorophyll & increases the production of the amino acid L-Theanine, which is thought to promote relaxation and concentration. Matcha comes from Japan and the most popular growing regions are in the southern half of the country: Uji, Nishio, Shizuoka, and Kyushu. There are different grades of matcha which are determined by the quality of the appearance, processing method and ingredients used. Ceremonial grade matcha green tea powder is the highest quality green tea powder available. It is made from the youngest tea leaves with the stems and veins entirely removed. The color is vibrant green, with a very delicate sweeter taste and extremely fine texture. This type is ideal for traditional Japanese tea ceremony which we got to experience in Kyoto. Someday, I will write a whole blog post about our experience. Culinary grade matcha green tea powder is a good quality matcha often used for cooking and baking. It has a slightly bitter taste, more grassy smell but visually it is less green in color. It is meant to be mixed with other ingredients but you can certainly enjoy it with hot water like a traditional matcha. Culinary grade matcha powder is further categorized into five main sub-types: premium, café, ingredient, kitchen and classic. Nutritionally speaking, matcha is rich in catechin polyphenols – compounds with high antioxidant activity particularly EGCG (epigallo-catechin gallate). EGCG have shown some protective benefits against health conditions such as cancer, cardiovascular disease and metabolic disorders like diabetes, obesity but again, matcha is not a magic bullet. Matcha contains trace vitamins, minerals, and caffeine. An 8 oz glass of matcha green tea (1 teaspoon matcha powder) has about 70 mg of caffeine vs. 77 mg of caffeine (1.5 oz) in espresso vs. 95 mg of caffeine (8 oz) in brewed coffee. Regular cow’s milk was creamier and created more froth. Almond milk was lighter in texture, not much froth. Oat milk felt creamier but little watered down, not much froth. Granulated sugar and sweetened condensed milk made rich, sweet drink while honey had a mild sweet taste. Sweeteners can definitely be adjusted per taste. Personally, my favorite was cow’s milk with equal ratio of matcha and sweetened condensed milk for an indulgent drink but 1st thing in the morning kinda drink, I enjoy matcha with regular or almond milk and honey. For vegans, maple syrup or granulated sugar is a good alternate. 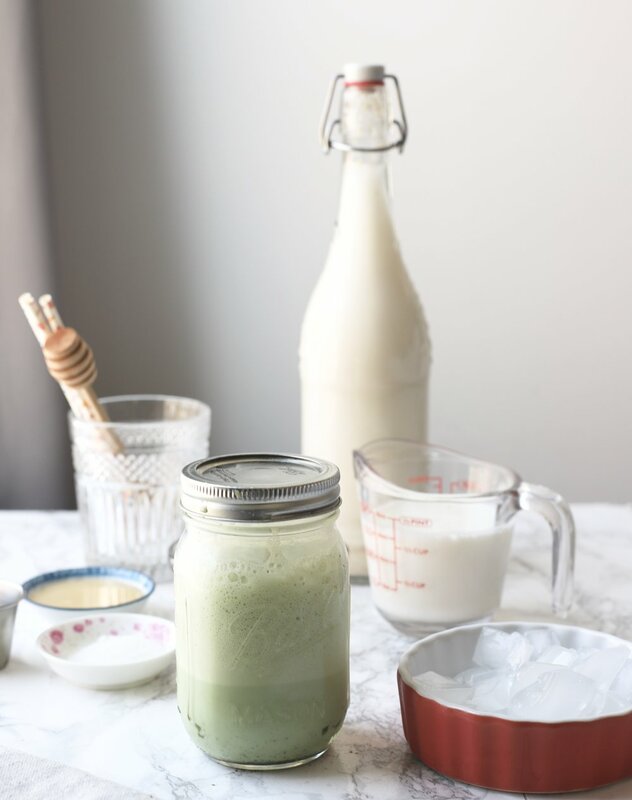 I will share my go-to recipe for quick Matcha Milk Tea at home with no fancy equipment required. Feel free to adjust the ratio per your liking. In a mason jar, add matcha tea and mix in with sweetener. Add milk and gently stir everything with a spoon. Close the lid of mason and shake everything vigorously for 30-45 seconds. Th mix should be foamy and mixed well. Pour into a glass and top with ice. Alternatively, you can add ice to the mason jar and enjoy directly too. Don’t forget to tag me @foodpleasurehealth if you make this recipe or, pin it for later use.